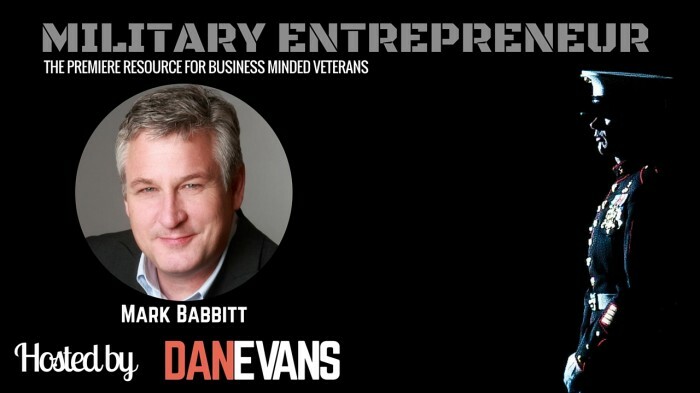 This week’s Military Entrepreneur is Mark Babbitt, a renowned business speaker, author, and leadership expert. He served four years in the United States Air Force, he masterfully managed to learn the art of building relationships during his transition. Mark’s hard work and innovativeness really paid off, he subsequently had six job offers in Silicon Valley following his military service. Mark shares his story of transitioning in and out of the corporate grind and branching out to start his own business. Admittedly, Mark claims his parents have always known him to be entrepreneurial, this has shaped and changed his trajectory in a great way. Straight out of the military, Mark credits much of his success to seeking out mentors to meet over a cup of coffee; then nurturing the relationship- something he learned so well, Mark now specializes in training young talent communities with these kinds of rare skills to help them make it into the business world. Mark Babbitt – a veteran of the USAF – is co-author of A World Gone Social: How Business Must Adapt to Survive . An in-demand speaker and mentor, Mark has been named a “Top 100 Leadership Speaker” and “Top 50 Leadership Innovator” by Inc. – and one of “15 Twitter Accounts Every Entrepreneur Should Follow” by Business News Daily. Mark serves as CEO of YouTern, a community that enables young talent to become highly employable. He’s also President of Switch and Shift, a site that champions Social Age leadership. His newest community, ForwardHeroes.org, will launch in 2016 to help military veterans transition successfully into civilian careers.